While there’s still plenty of denial in mainstream dentistry about the health risks of mercury amalgam “silver” fillings, environmental concerns like the ones we raised last week are hastening the retirement of this toxic and antique material. The Minamata Convention on Mercury is a key part of this. It is estimated that by 2030, dental amalgam will be the greatest source of environmental mercury – remember this is not just linked to use in a dental surgery, but to other sources, such as crematoria emissions. It is all too easy to conceive that the use of dental amalgam may no longer be tolerated by an environmentally conscious public. 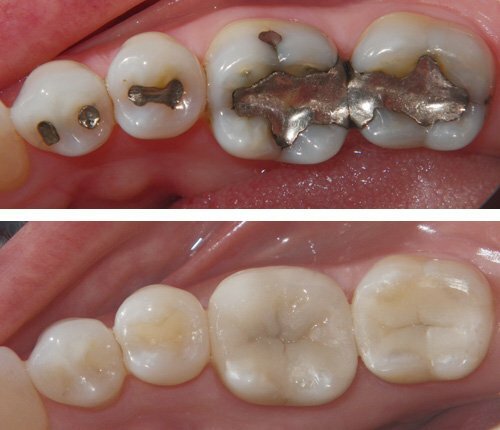 Suffice it to say, that puts a considerable amount of pressure on dentists to start switching to amalgam alternatives now – though here, too, there’s some resistance. According to the BDJ survey of 270 British dentists, the main concerns involve time and money. Simply, amalgams are less technique sensitive than composite resin, glass ionomer, or ceramic restorations. They can be placed more quickly, meaning more patients can be treated in a single day. More patients, of course, means more income. At the same time, the up-front costs are cheaper, which is why amalgams are favored by government programs such as the NHS in the United Kingdom and Medicaid here in the US, as well as insurance companies. But the cost of mercury amalgam doesn’t end once a filling has been placed. Once you factor in the costs to human and environmental health, the real cost of mercury fillings is substantially higher than for the alternatives. In our office, our concern is not with moving through as many patients as possible but supporting their total health through holistic, biological dentistry. Our emphasis is on the quality of care given to each patient. This means taking the time to evaluate each patient’s needs and providing them with biocompatible options when it comes to repairing damaged teeth. No single material – whether composite, ionomer, or ceramic – is right for every tooth of every patient. Always, we have to look at the big picture.